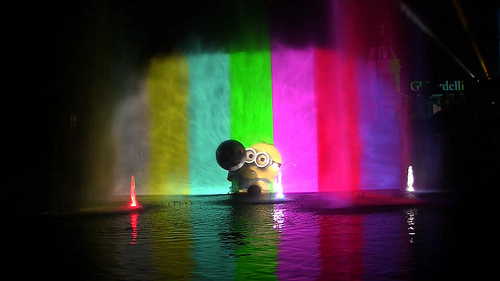 It seems that Universal Orlando has accidentally spilled the beans about their new nighttime spectacular on the lagoon of Universal Studios Florida. What’s even more impressive? They did it on their own website. Before we start, it’s fair to say that this was not completely intentional on Universal’s part. This is one of their biggest projects of 2018 and they wouldn’t just casually list concept art and a name that has yet to be officially announced anywhere else. No social media, no blog posts and no press releases as of the writing of this article. Yes friends, if you click on this link it will take you to the “See What’s New” page of Universal Orlando Resort. Now my guess is Universal Orlando’s press office will have an “oh crap” moment when they see this article and possibly yank it down. So if you click it and the above image isn’t there, indeed there might have been some four-letter words thrown around the office until they were ready to at least formally announce the name and overall storyline. In short – when you click on that link, the above image may or may not still be there. Starting this summer, nights at Universal Studios Florida™ will be brighter and bolder than ever as music from the world’s biggest films fills the air and scores of dancing fountains erupt. Massive walls of water blaze with epic movie moments and powerful projections bring the entire waterfront into the movies. You’ll see and hear roaring dinosaurs from Jurassic World, feel the adrenaline rush of high-speed cars from Fast & Furious, watch the mischievous antics of the Minions from Despicable Me, and so much more. Don’t miss the amazing new show that’s lighting up select nights all year long. Readers of Theme Park University may recall an article we did several weeks ago about Universal Studios Florida’s new nighttime spectacular. As always, we love to throw easter eggs out regarding new announcements and this was no exception. All over that article, we called this new show “epic” over and over, a nod to the final title of the new show. 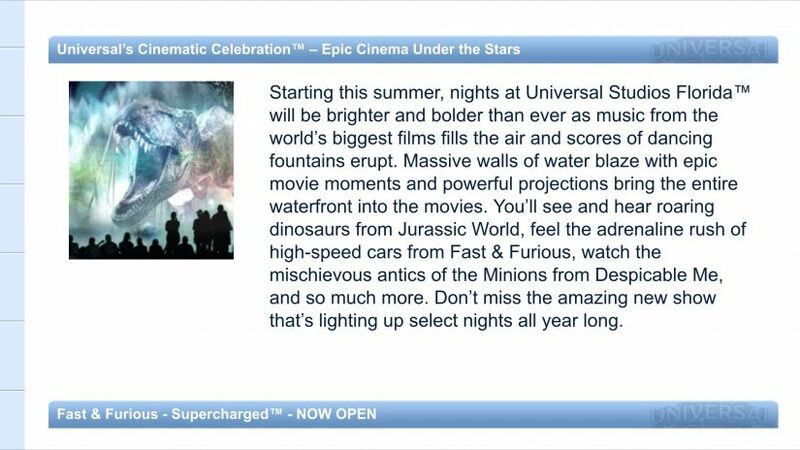 In addition, we predicted that this new nighttime spectacular will feature scenes from: Jurassic World, Fast & Furious, Despicable Me and… well, more. What’s the more? Harry Potter, Transformers and well…. why don’t you head over here to read all about it? (Warning: Spoilers Ahead). We have said it before and continue to echo it, “Universal’s Cinematic Celebration – Epic Cinema Under The Stars” will be the sleeper hit of the summer in Orlando. What are your thoughts? Are you looking forward to the new show? This entry was posted in Universal and tagged Nighttime Spectacular, Universal Orlando, Universal Studios Florida, Universal's Cinematic Celebration. Bookmark the permalink. Trackbacks are closed, but you can post a comment.